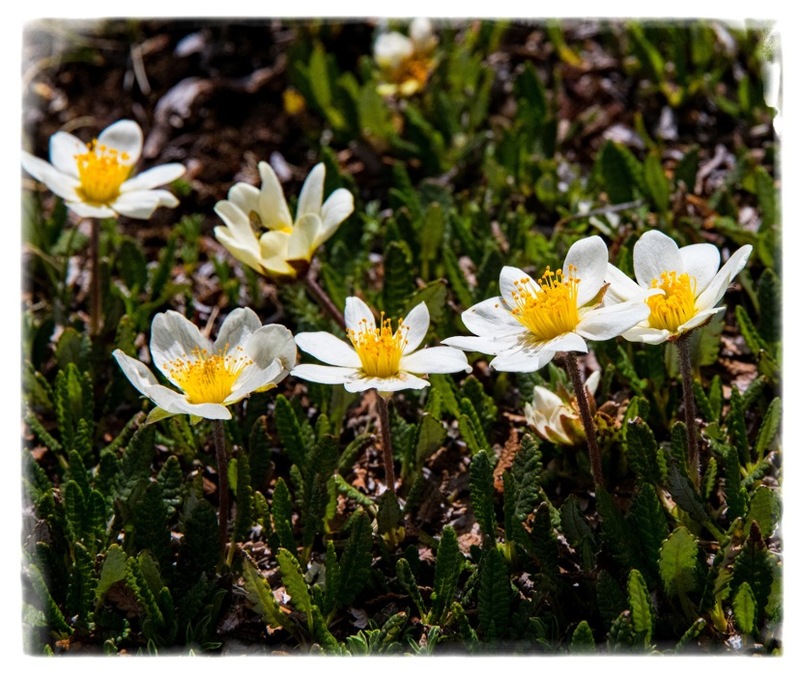 The flowers of Mountain avens track the movement of the sun across the sky during the day, a phenomenon called heliotropism. Most plants that have similar abilities do so to reduce the amount of solar radiation striking their flowers or leaves. In Dryas, the flowers do the opposite, moving to maximize the amount of sunlight reflecting off the petals and onto the mass of pistils at the center of the flower. Experiments by researchers in Sweden have shown that flowers that track the sun are warmer and have pistils that develop faster and produce heavier seeds than those that are in shade. It is a circumpolar species found in arctic tundra of northern Eurasia and North America, but also extending southward above tree line in the Cascades and Rocky Mountains to Washington, Oregon, Utah, and Colorado. Elizabeth Croston Buckalew: They are! Thanks, Harry! Elizabeth Croston Buckalew: Thanks so much, Larry! Three nice pic's Elizabeth, I like how each one is closer, they are a lovely colour also. Elizabeth Croston Buckalew: Thanks so much, Frank! I'm glad you think it works... Yes - I do like that creamy white with the bold yellow stamens! What gorgeous flowers with these explosive anthers and filaments!! Elizabeth Croston Buckalew: Thanks, Steven! Great description! hat interesting info here about these beauties, Elizabeth. Elizabeth Croston Buckalew: Thanks, Ginnie! And again - such tiny little creatures! Elizabeth Croston Buckalew: Thanks so much, Claudine! I'm so glad you've enjoyed these photos! OH, these are darling flowers, Elizabeth...Opening up to get as much sun as they can get!! Elizabeth Croston Buckalew: Aren't they! Yes - true sunflowers will do that! I have seen flowers that do seem to react to the sun but I'm not of any that move during the day to maximise their exposure. At the Mad House, we did have some indoor trees in giant containers and over the year of two would lean towards the light until one day, one fell over! Elizabeth Croston Buckalew: Yes - true sunflowers will do this also. I have to keep turning my rubber tree plant so it doesn't tip over! Elizabeth Croston Buckalew: I thought you might like a little series on flowers! These flowers seem to be shouting their presence like trumpeters. I made be small but can act big. Elizabeth Croston Buckalew: Some of us humans feel the same... though I try not to be too loud! I am sure they look happy, growing in their patches in the mountain breeze. Elizabeth Croston Buckalew: They do seem to be a happy little bunch! These are similare to the marsh marigolds you showed. Very pretty. Elizabeth Croston Buckalew: They are - teenier, and with smaller leaves! Elizabeth Croston Buckalew: Well there ya go! Thank you, Sherri! That third shot shows just what a lovely flower it is. Going by your narative it seems to be a very clever flower. Elizabeth Croston Buckalew: Thank you, Brian! Yes it is! I love how this little flower looks SO BIG in the last photo. The shadow of the pistils is terrific. You also got very sharp leaves all around...really nice DOF. Very sweet flower. I feel like they are singing. Elizabeth Croston Buckalew: Thanks, Bonnie! The land of the small.... I really appreciate your comments - thank you!